The Samvit Wellness Interactive Sound Medicine Course is an accredited course in holistic medicine presented by Dr. Sergey Sorin. This experiential workshop is for health care professionals who want to expand their knowledge of sound healing while learning practical applications for patient care and for those looking to utilize sound therapy for themselves. In this program participants will be introduced to a well-researched state of the art technology that facilitates deep relaxation, sleep and pain management among other things. Samvit Wellness was founded in 2013 to work with the Body, Mind and Spiritual aspects of the person for the best of Health, Wellness and Optimal Life. Samvit Wellness educates health professionals, the consumer and the caregiver on how to integrate holistic medicine and conventional care with the intention of optimizing people’s health, vitality and quality of life. Samvit Sound is scientifically and clinically researched “audio guidance” technology refined and continuing from over 50 years of research with Binural Beats. Researchers learned that specific sound patterns could lead the brain to various states of consciousness ranging from deep relaxation or sleep to creative and focused states. How Do We Know This Stuff Will Work? We all experience a range of normal brainwaves that can be measured by an electroencephalogram (EEG). This device measures our brainwaves as well as provides a means to evaluate what states we might be experiencing at any given moment, states that are considered normal and part of our daily experience. When we are measuring cerebral signals we typically find readings ranging from 1 to 20 Hz, although, we are capable of reading lower and higher signals. To better understand, we’ll discuss several brainwaves patterns or the Languages of the Brain (to the right). 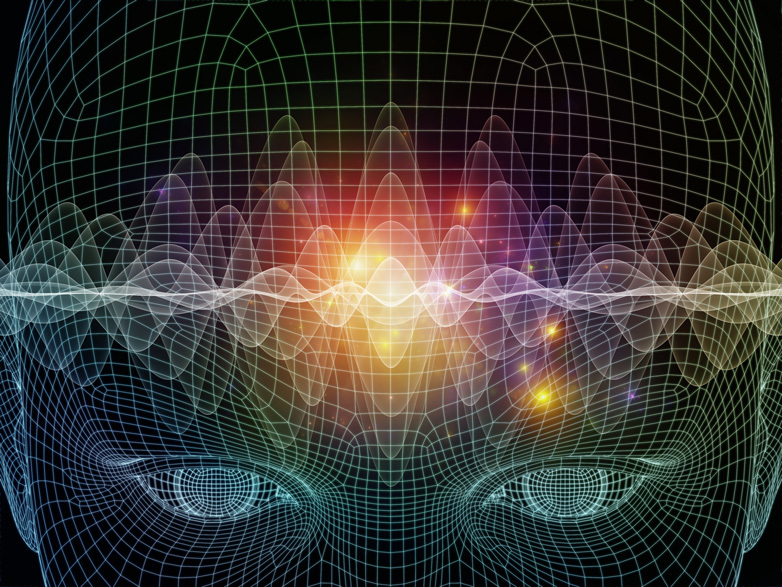 We can measure brainwaves using cycles per second, which is called a hertz (Hz). The lower number means slower activity is occurring in the brain. Beta frequencies originate in the cortex, the thinking/reasoning part of the brain. Beta is the state of awareness we tend to find ourselves in when we are wide-eyed and alert. A beta state is indicative of times when we are engaging with life—being busy or productive, worrying, fretting, concentrating or being fully engaged in an activity. When we are in this state we are usually wide-awake and alert. Alpha waves originate in the thalamus, the great relay station in the brain that receives sensory input from external and internal stimuli and then passes them on to the cortex and other parts of the brain for processing. One way to think of alpha is in terms of driving a manual transmission car when the stick shift is in neutral. From a neutral position, one can easily transition to the action phase (beta) or to a state of relaxation (theta and delta). This state or these frequencies can be achieved when relaxing or meditating. Children under the age of six years spend much of their waking time in the alpha brainwaves regions. Typically, one is lying or sitting quietly with eyes closed to reach this state. We tend to step “out” of an alpha state when our eyes are open, when we are thinking or when we invite in our analytical mind to evaluate and review. Delta waves are generated by the brainstem, especially during sleep, and allow the cortical, thinking brain to be down regulated when we need to have rest and recovery. This state typically occurs when one is experiencing a deep level of sleep. Studies indicate that a person benefits mentally and physically from regular delta experiences while sleeping. Delta is also involved in global communications of the cortical brain and has a multitude of other functions. Gamma waves have been observed in meditating Buddhists monks. This occurrence suggests when in exceptional circumstances, and without technology, gamma may be experienced and is usually measured in the 35 to 45 Hz range, especially 40 Hz. Gamma waves are typically associated with higher mental activities, peak performance, great intuitive insight and deep clarity during meditation. This state could be described as: “being in the zone.“ There is evidence to suggest that a novice can be trained to experience heightened and extended gamma activity. Gamma states cannot be created using binaural beat technology. However, other sound technologies utilized at Samvit Sound (R) the capability of helping guide us to a gamma state. Patients experiencing the symptoms and stress of serious illness are seeking the sleep, relaxation, and stress relieving benefits that sound healing technology has to offer. ER Doctors are often over worked and over stressed. Sound technology offers relief not only to their patients, but for the doctor as well. Short naps can feel like hours of needed sleep with proper application. Cancer patients deal with severe side effects from conventional treatments such as chemotherapy. Binaural beats and other sound technology has been shown to help manage these symptoms. Reduced nausea, improved sleep, and an overall sense of well-being are commonly observed benefits. People dealing with pain associated with illness, injury, and recovery can add sound technology to their tool box of modalities. By synchronizing the brain’s hemispheres, one can more readily improve sleep and deeply relax while learning techniques to diminish pain signals. Dr. Sergey Sorin is one of the top physicians and teachers leading the medical renaissance into the new age of holistic health and healing. I consider myself very fortunate to be able to learn from him and find amazing uses for the sound technology and Dr. Sorin's teachings! Dr. Sergey Sorin is one of the most compassionate physicians I have ever met. He is not only a great medical doctor but is also a phenomenal healer. He combines the best of Western Medicine with the best of Holistic and Integrative Medicine. His knowledge, wisdom, and intuition combine to provide patients with a most nurturing and healing experience. Optimal health is a goal that you can achieve with Dr. Sorin as your physician, guide, and healer.